Today is the first day of the new '08' registration series and there were plenty of new cars out and about this afternoon. I am sure it wont be long before I get my first truck or van 08 but for now I will spend this week looking back at some of the 07s which started exactly one year ago. 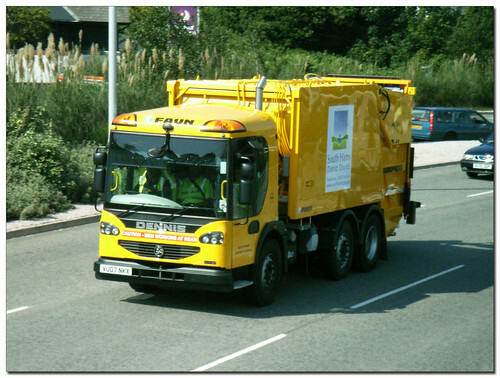 The first is VU07NKX Dennis Elite2 dust cart from South Hams District Council. This one is a bit of a mystery as when I checked the registration against several web sites that query the DVLA database it comes up as a silver BMW Mini!